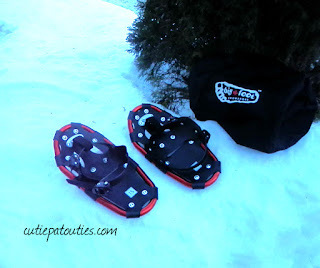 The Handmade Corner: Snowshoes for Toddlers? My husband and I both have snowshoes and we enjoy them! We thought we would get our little 4-year grand daughter involved as a nice, winter activity. I wasn't sure if they made snowshoes in such a small size, but to my surprise, the Big Foot Snowshoe Company makes a 15" snowshoe for toddlers, with a capacity of 20 - 60 lbs. The company even gave us a free carry bag! Who can resist something free! !